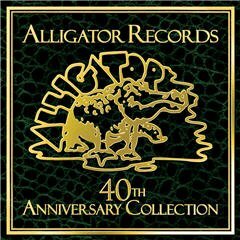 Just as the Queen of the Blues Koko Taylor belts out in the opening lines of her “I’m a Woman” that starts the album, you know “everything gonna’ be alright” about the 40th Anniversary Collection from Alligator Records. From the indie label’s beginnings with Hound Dog and Koko Taylor in the 1970s to its more recent releases from the likes of JJ Grey, Anders Osborne, and Eric Lindell, Alligator sure has covered a lot of ground over the past four decades, all of it under the slogan of “Genuine Houserockin’ Music.” With a catalog of now nearly 300 titles, there’s of course no lack of good stuff to chomp on, with much of the best of it captured nicely in this compilation’s 38 tracks. In addition to Koko and Hound Dog, this latest anniversary collection includes songs from such other masters as Albert Collins (“I Ain’t Drunk”), Luther Allison (“All the King’s Horses”), Elvin Bishop & Little Smokey Smothers (“Roll Your Moneymaker”), and Buddy Guy & Junior Wells (“Give Me My Coat and Shoes”). Roy Buchanan’s fiery guitar is joined by Delbert McClinton’s vocals on 1986’s “You Can’t Judge a Book by the Cover,” while Johnny Winter provides some fire of his own with “Mojo Boogie.” There’s the piano boogie of Professor Longhair on “Red Beans,” the horn-supported country blues of Corey Harris’ “Fish Ain’t Bitin’,” and even a few instrumentals that themselves exemplify Alligator’s rich and continuing history: Lonnie Mack and Stevie Ray Vaughan’s “Double Whammy” from Mack’s 1985 Strike Like Lightning and James Cotton’s “With the Quickness” off the harmonica legend’s 2010 release Giant. You’ll also find songs from former and current Alligator artists such as Tommy Castro, Mavis Staples, Janiva Magness, Eddy “The Chief” Clearwater, Shemekia Copeland, the Holmes Brothers, Katie Webster, Lil’ Ed & the Blues Imperials, Marcia Ball, Roomful of Blues, Charlie Musselwhite, Saffire-the Uppity Blues Women, and Tinsley Ellis. Hound Dog Taylor’s “Sitting at Home Alone” is the very essence of the blues; if that doesn’t work for you, try the horn-laced “Daddy Pinocchio” from William Clarke. Other highlights include a Luther Allison-sounding “Strange Feeling” from Michael Burks, Lonnie Brooks’ “Don’t Take Advantage of Me,” the rocking “Have Blues, Will Travel” from Smokin’ Joe Kubek and Bnois King, the New Orleans shuffle of Eric Lindell’s “It’s a Drag,” and Anders Osborne’s Dylan-esque “Echoes of My Sins,” along with Buckwheat Zydeco’s take on “When the Levee Breaks,” which just may be the funkiest and most exhilarating version of the song you’ll ever hear, combining Sonny Landreth’s slide guitar with Buckwheat’s own amazing accordion and organ work. It’s entirely fitting that the collection draws to a close with the slow quiet soul of JJ Grey’s “The Sun is Shining Down,” not only for the song’s inspirational presentation and lyrics (Glory, glory, Hallelujah/ the sun is shining, shining down/ Glory, glory, Hallelujah/ I’m alive and I’m feeling, feeling fine), but also as a great example of the label’s bright future. On the whole, Alligator’s 40th Anniversary Collection is a hard-hitting, solid endeavor, with the label’s motto of “Genuine Houserockin’ Music” holding just as true today as 40 years ago. This entry was posted in Albums and tagged Albert Collins, Alligator Records, Buckwheat Zydeco, Buddy Guy, Elvin Bishop, Hound Dog Taylor, James Cotton, JJ Grey & Mofro, Koko Taylor, Luther Allison, Tommy Castro. Bookmark the permalink.